What purpose and passion do you have? There aren’t many entrepreneurial men who spend their days in a pinstripe suit and their spare time climbing the world’s highest summits – all while using their business to do good. Deri Llewellyn-Davies has been a committed adventurer for the past ten years. Having climbed five of the world’s highest seven mountains, completed the infamous Marathon des sables across the desert and the Epic Ironman, he also happens to be a best-selling author of Life’s Great Adventure and winner of the 2013 Global Angel Award for putting his compassion into action, volunteering his time, energy, skills and money to do good. Deri at Everest base camp wearing pieces from the Tengri Warrior collection: Gloves, Beanie, handknitted Pixane sweater. Deri’s mission to take on Everest was part of a dream and ten years of planning to achieve. His goal was both a personal challenge and a social one: aiming to help the Sherpa community which in 2014 suffered a tragic loss of 18 men. With Neal Laughton leading the team, they attempted to set the world-record for the highest-altitude black-tie dinner party, raising funds to support Community Action Nepal. We were delighted when Deri agreed to field test our everyday sweaters, beanies, gloves and socks in one of the world’s most challenging environments – Mount Everest. While taking on Everest, the team was caught in the midst of Nepal’s recent deadly earthquake. “Man plans, God laughs,” says Deri. One can prepare as well as one can but nature will have the final say on the outcome. Listen to his amazing and humble account of how he survived this epic natural disaster. What adventures have your passions and purpose taken you on? Let us know @HouseofTengri on Twitter. Pembs TV interviewed the strategy man on his recent adventure of surviving Everest during the Nepal earthquake. The Strategy Man is the #1 Bestselling author of BGI Strategy on a Page. He is the acclaimed expert on business strategy for business owners in the UK. 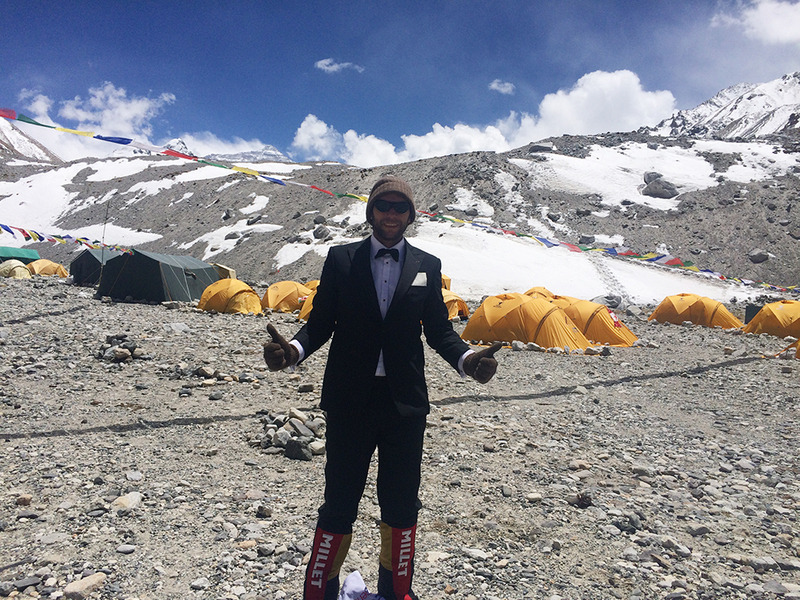 Deri attempted to set the world-record for the highest-altitude black-tie dinner party, raising funds to support Community Action Nepal. He is WEARING THE BASIC BEANIE FROM THE TENGRI WARRIOR COLLECTION. © TENGRI LTD. PHOTO CREDIT: DERI Llewellyn-Davies. Slideshow photos of Everest climb by Jon Maguire. © Tengri Ltd.